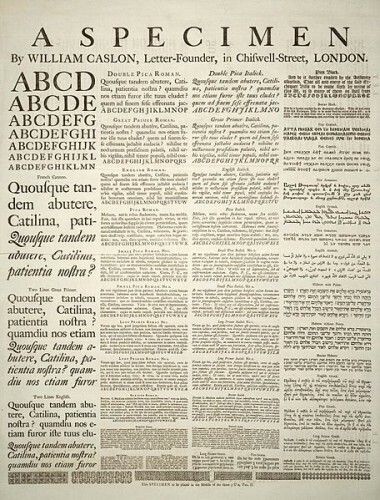 Just as the word “typeface” has a history, so does the word “font.” This word is derived from a Middle French word, fonte, which means something that has been melted. When moveable type was first introduced, each individual character was created by melting metal and pouring it into a hand mold. So a font is any variation of a typeface. The variation can be in size, bold print, italics, or anything else that changes the look but not the style of the typeface. As I mentioned above, Times New Roman is a typeface that I am sure you either use or have at least seen. If you are writing a piece and choose Times New Roman, 12 point, bold, you have chosen a font. If you switch to Times New Roman, 12 point, italic, then you have changed your font but not your typeface. Now does it make a bit more sense? As a huge fan of typography, these terms mean something to me. It is important to know the proper terms for the work that you do or the things that interest you the most. In my opinion, for me to not know what these words mean would be like a builder not knowing that there are many variants when laying the floor in my new house. Wood floors can be oak or pine, laid in a straight line or a pattern, natural or high-gloss finish. If I choose an oak floor in a geometric pattern with a gloss finish, that would be my font. Wood floor would be my typeface. Knowing the difference between typeface and font will not solve all of your worldly problems, but wouldn’t that be nice? It is, however, one little piece of knowledge that you can add to your already-full-to-the-brim brain. The next time someone asks your favorite typeface, you will know exactly how to answer them.